Please register so we can update you easily about competitions or changes thereof. There are two LRRP competitions this Dec. 5, 2010.
so far these are the only ranges with anything above 50 meters. Would appreciate any suggestions within the NCR or outside NCR. Can you provide the addresses and the mebership contact for Tierra and Langhaya ? I practice on my land 50 yds to sawa. I need standard targets for practice. Give me a couple of days and will post addresses and club info. The firing range of Tierra del Fuego Shooting Club is located within the Splendido Taal Residential, Golf and Country Club. The entrance to Splendido Taal is located along the Taal Ridge Road, a few kilometers after the provincial boundary of Cavite and Batangas (the incongruous looking one with the cement fruits on top). The most identifiable marker would be the brick building on the left side of the ridge. It is however a private firing range and you would have to get the permission of the gun club to use it. The gun club president is Cong. Jack Enrile, who is also the president of the Philippine Practical Shooting Association and the International Practical Shooting Confederation's Regional Director for the Philippine Region. Be that as it may, the range is not presently accessible you need to cross a riverbed that is normally dry during summer, but is now waterlogged because of the rainy season. The gun club will be hosting a Level I handgun match on December 5 for the pioneer shooters of the PPSA. If plans pushes through, we might just hold a demo PTRA shoot during the event. We will keep you posted. Re: Where to shoot (Ranges)? [img] [/img]This is sailor practicing in the range at 50 meters - shot taken by sonny marin.. Sailor using a model 37 remington with nikon scope and CCI bullets. 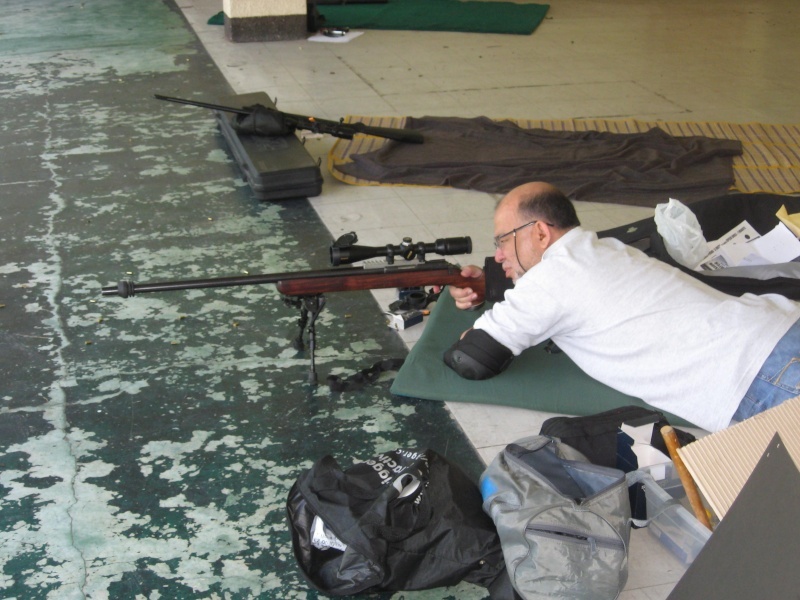 Sailor - Admin wrote: [img] [/img]This is sailor practicing in the range at 50 meters - shot taken by sonny marin.. Sailor using a model 37 remington with nikon scope and CCI bullets. I have had inquires on this sport, but about 4-5 guys are going to meet at Marikina in Nov. and try out several rimfire tactical targets, but we ar not sure if your Group uses these for standard use. Looking forward to hopefully meeting you guys. I ca not get into Langhaya because as you said it is private, May I inquiry if this group is already registered as a FA Group in FED, because some would like to join, but can your group process PTT. I am wondering why Langhaya was chosen, is it because of the long range facilities or proximity to your location ? Would Langhaya accomodate PTT for your group there ? The accreditation papers for the rifle association is currently being processed. That said, we do have permits to transport our .22 rifles that was issued by the PNP-FED. I am certain that once the association is duly recognized by the PNP-FED, we should be able to secure PTTs for the .22 rifles of the members - assuming that there is no change in the regulatory environment of course. Why Langhaya - for several reasons- one. we know the owner Ed F. nice guy and two yes they have a 100 yard range with plate at 125 and a possible 250 with two ranges combined and a little trimming of some trees. Looking at Langhaya as a circuit range and possible alternate for NCR as long as we do not interfere with the shotgun programs already being housed there. Langhaya is the closest NCR range with that length and it is fantastic in terms of the wind and plants. Looking at it as a range wherein the shooter has to read the wind without wind flags but read it from the trees and the plants around it thereby forcing the shooter to read natural wind indicators. For the circuit - meaning we will hold competitions in various ranges for different challenges to bring out a variety of challenges for the shooter and entice the clubs to setup rimfire clubs of their own.We have checked out the bonifacio marine 50 meter range good for 50 meter prone, three postion, a mild biathalon modified course; langhaya for the flagless wind course, clark with Rosey L. for the summer mirage course wherein the shooter has to read the wind via the mirage only - a technique which one can learn easily but needs the expereince to appreciate it. Armscor with two possible ranges one fifty the other 75 meters.. Then there is Splendido if allowed with the capability of providing ranges of up to 100 200 300 with winds from the back, front, side, etc. - even with wind flags you will get lito...we can set up downhill and uphilll shooting in the area, they have areas with mirages also if the conditions are right. Have not yet seen the other ranges in Butuan and Davao wherein they have some serious rimfire shooters there and some nice ranges also. Would like to propagate this such that all clubs and ranges will set up their own rimfire clubs and courses. Sorry for the delay in the setup but we are looking at after the gun ban to go fulll speed with this.Gun BAN STARTS JAN 10 I BELIEVE. As of now it is planning and talking to range owners so we can provide the competitions and facilities once we start, as FED will require a program to be able to justify the issuance of transfer permits for the sport. Hope i don't bore you with my long words. Right now best place to shoot is Armscor with their 50-75 meter range. The other places are Langhaya, Clark, SEG in Bonifacio and Splendido when there is an official competition on. As mentioned in the other thread - will set up monthly shoots and weekend practices at the Armscor range. This to start after the week of Oct 11 as I will be out of town. There are however a bunch of shooters who parked their rifles at the range and are practicing. The rules are still with PPSA and hopefully by Oct. the first draft will be approved. During rainy season - Splendido is tough to get too as one needs four wheeled vehicles and lots of newspapers for all the mud trucked into the car. Should the weather improve - will ask Jack permission but have to give in all names as to who will be with the group. I have shot there up to 600 with High Powered rifles - for the rimfire have shot up to 200 meters - beyond that we need reactive self setting plates - unless you want to walk a lot or we are getting our dope by shooting 6 foot high manila paper.... It is a fantastic range with wind, angles, and distance.... hopefully we can get one also in Subic....have to check it out.